Wordless Wednesday: Shade is Delite-ful! 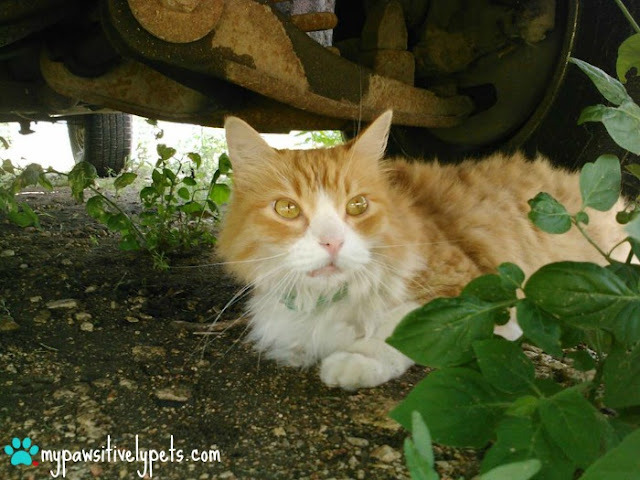 Now that it's been much hotter outside, Honey Delite is spending her days underneath this old truck where it's nice and shady. The truck is almost never driven, so she is not in danger under there. She has a nice view of the nursery barn and the people that come and go. She even comes out during the day when people are around to snack on her cat food. Based on Honey Delite's thin pupils, I'm guessing it's super sunny where you live! Yep - very sunny! Almost blinding in fact! Stay cool Honey Delite and have a wonderful Wednesday. Hot for you, cold for us. Glad there's a nice place to hide from the sun. Best make sure that truck never moves. Hehe - I don't know why anyone would WANT to drive that thing! I've driven many years ago and it was horrible... no power brakes, three on a tree transmission... not fun! What a beauty, the name Honey Delite suits her well! It looks like a great observation spot! Beautiful cat. She looks nice and comfy there. Happy WW! That#s a good place! have a wonderful wednesday ! that is one smart kitty! Keep cool! Well her job is supposed to be hunting critters! There aren't too many bad critters out there during the daytime... maybe just some rabbits. She's so cute and I just love her name! Haha I wasn't a huge fan of her name at first, but I think it suits her. I just didn't change it when we adopted her. Thanks Speedy - she's a bit dirty, but that's to be expected from being outside. I need to see about brusing her a bit, I think she will let me do it now. Oh she is so pretty. Is that a collar on her?? She sure is cute. Take care. Yep she's got a collar on. Oooh, she is so pretty Miss Ann! Hi, Honey Delite. You're so smart. We hope you had a happy Wednesday. Purrs, Ateret, Livia and Abbi. The perfect spot: You can see everything and everyone, but no one can see you. Happy spying! You got it made in the shade HD. Good job keeping it real. Stripper name? HAAA! Looks like a nice cool place to rest! She is just gorgeous! And now she has it made in the shade! hay ewe gorgeous...we haz lots oh hammicks in de shade heer in trout towne... !! Me too. And I'm happy she is more friendly now! This is a beautiful picture... love yellow tabby cats! !